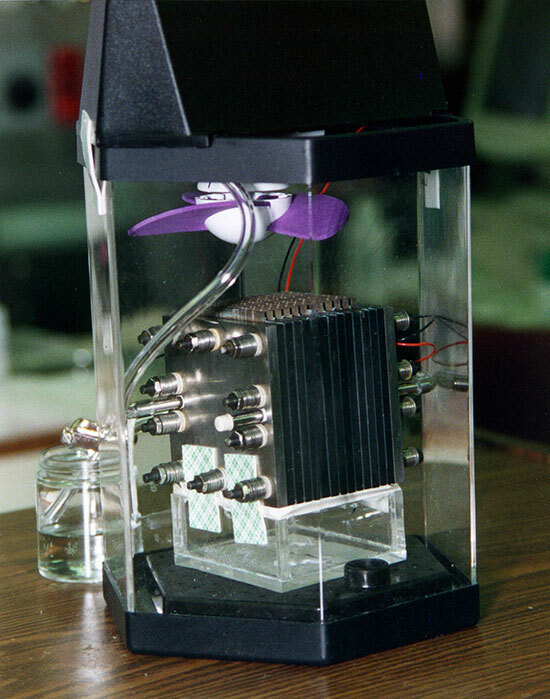 Fuel cells are a clean form of energy, with the primary byproduct being water. A fuel cell transforms chemical energy (liquid fuel) into electricity through a chemical reaction between positively charged hydrogen ions and oxygen. Every fuel cell has a positive electrode called an anode, a negative electrode called a cathode, an electrolyte that transports the ions from one electrode to the other, and a catalyst at the electrodes. As long as there is a continuous supply of hydrogen from fuel and oxygen from air, the fuel cell will produce electricity. A reaction between the hydrogen and the catalyst occurs at the anode, producing hydrogen ions and electrons. The hydrogen ions travel through the electrolyte to the cathode, while the electrons travel through an external circuit to produce DC current. When the hydrogen ions and electrons meet at the cathode, they react with oxygen, forming water. The electricity produced by an individual fuel cell is small, so multiple fuel cells are generally put together into a stack or placed in series to generate enough voltage to support an application. Fuel cells transform chemical energy into electrical energy directly with no intermediate steps, no moving parts, and with no significant loss in energy, making them particularly efficient sources of power. Fuel cells vary by the electrolyte used in them, and depending on the fuel cell, the energy efficiency typically ranges from 40% to 60%. By comparison, a typical car’s internal combustion engine is around 25% efficient. Generally, fuel cells have a high manufacturing cost. 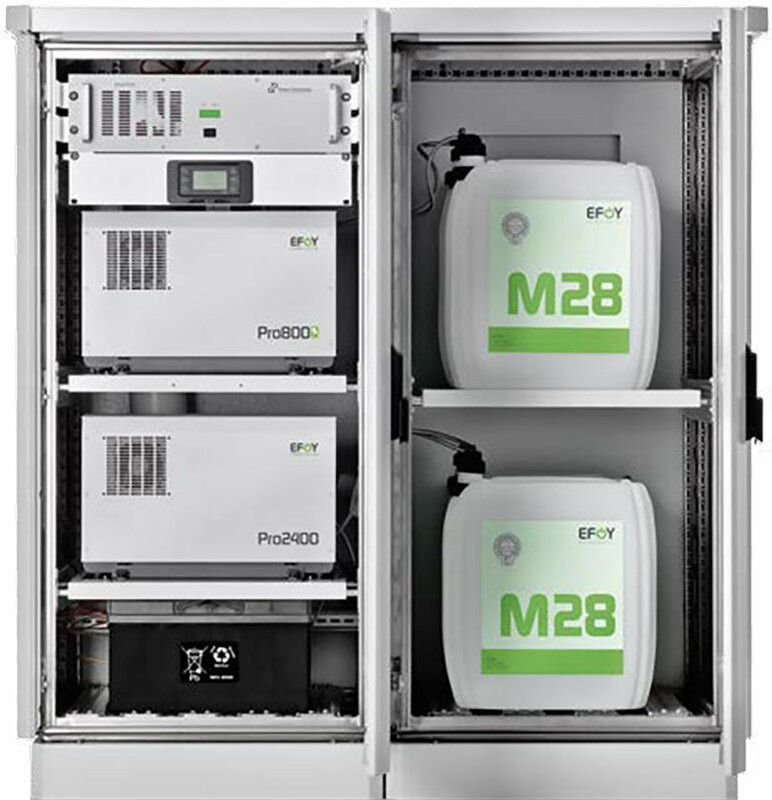 The direct methanol fuel cell (DMFC) used by SFC Energy is less expensive to manufacture than other fuel cell types. These fuel cells have a life expectancy of more than 4500 hours of operation. The ironclad rule of power generation is power generated in the circuit must be greater than the power that will be consumed in the circuit. Efficiency can be defined as the useful work performed divided by the total energy expended in accomplishing a task. The power generation source should be matched to the application and environment. A fuel-driven generator must run continuously in order to supply power to connected appliances; they are effective for short-term power production but are less efficient for long-term use. Solar PV cells generate power anytime there is daylight, reducing dependence on traditional means of generating power. The two main types of solar PV panel technology are rigid and flexible panels. The three factors that affect a solar panel’s performance are direct sunlight, operating temperature, and MPPT charge controllers. Wind power generation is best used as a supplement to other power generation sources. Wind turbines in colder climates generate greater power outputs than those in hot climates because colder air is more dense. Fuel cells transform chemical energy into electrical energy directly with no intermediate steps, no moving parts, and with no significant loss in energy, making them particularly efficient sources of power.